Christopher Whitlow, MD, PhD, MHA, specializes in clinical and translational neuroimaging, using innovative imaging modalities to study the longitudinal effects of aging, trauma and disease on brain development and cognition. In his collaborations with industry, he uses a range of structural and functional imaging capabilities in animal and human models to explore and analyze normal brain development, aging and disease pathophysiology, as well as the effects of interventions on imaging and cognitive biomarkers. Christopher Whitlow, MD, PhD, earned his medical and doctoral degrees at Wake Forest School of Medicine, where he was introduced to imaging through the study of animal models of addiction and the effects of interventions on cognitive function and behavior. He completed a residency in diagnostic radiology and a fellowship in neuroradiology at the School of Medicine. He also received a master of healthcare administration degree from the University of North Carolina at Chapel Hill. 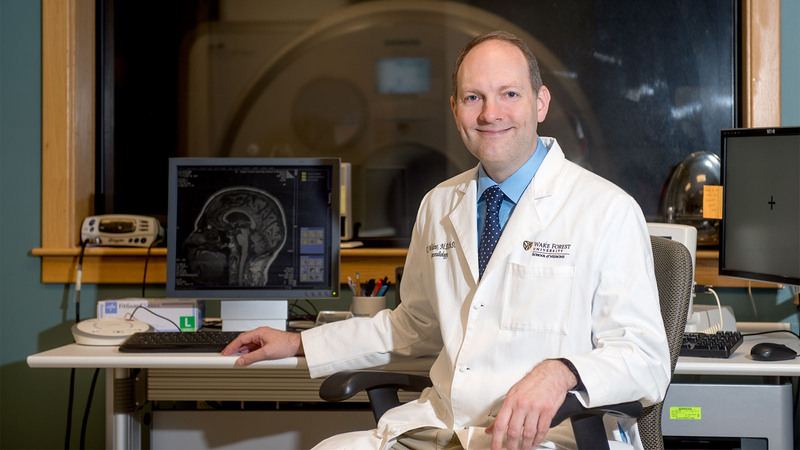 In 2010, Whitlow joined Wake Forest School of Medicine’s radiologic sciences department to research the clinical and scientific applications of neuroimaging. Clinical diagnostic imaging of the brain, head, neck and spine is the hallmark of Whitlow’s expertise, which spans the breadth of neurologic disease—from neuro-oncology, Alzheimer’s disease and dementia to movement disorders, psychiatric disease, traumatic brain injury and diabetes. Applying clinical knowledge to research efforts, he combines multimodal functional and structural neuroimaging (such as magnetic resonance imaging, positron emission tomography, magnetoencephalography, computed tomography) in human and animal models (including nonhuman primates) to study how factors like disease, trauma, medication and drugs of abuse affect the central nervous system and other organ systems longitudinally. Whitlow’s current National Institutes of Health-funded initiatives examine the effects of traumatic brain injury and subconcussive head impact in youth and high school football players, using imaging, biomechanics and cognitive data to analyze how cumulative head impact exposure affects cognitive performance and function over time. He also collaborates with the Wake Forest Institute of Regenerative Medicine to study the benefits of hormone replacement after menopause and examine physiologic changes in hormonal levels, brain structure and function and bone density relative to pharmacologic intervention. Through industry collaboration, Whitlow explores the effects of various interventions, therapeutics and disease processes on brain mechanisms and physiology, offering diverse imaging capabilities, animal models, high throughput image processing and analysis. He is particularly interested in multimodal imaging approaches that examine cognitive function relative to blood flow, functional connectivity, microstructural integrity, glucose utilization mapping and magnetic signature of electric impulses. Access a full range of state-of-the-art preclinical and clinical imaging technologies and detailed analysis capabilities made available to industry partners through the Center for Industry Research Collaboration. Access the expertise of researchers at Wake Forest Baptist Medical Center to investigate solutions to aging-related conditions, diseases and disorders. Wake Forest Baptist Medical Center’s biomedical engineering program develops groundbreaking methods to assess and improve overall patient health. Our experts at Wake Forest Baptist specialize in a wide array of biomedical engineering fields, such as trauma treatment, biomechanics, nanotechnology, biomedical imaging and organ and tissue engineering. Solingapuram Sai develops and evaluates preclinical and clinical radioactive tracers and positron-based radiopharmaceuticals for diagnostic imaging and disease treatment.